MISSION: Help teen girls feel that they are not alone in their body image struggles and to connect them to expert advice in a format they are interested in and can engage with. 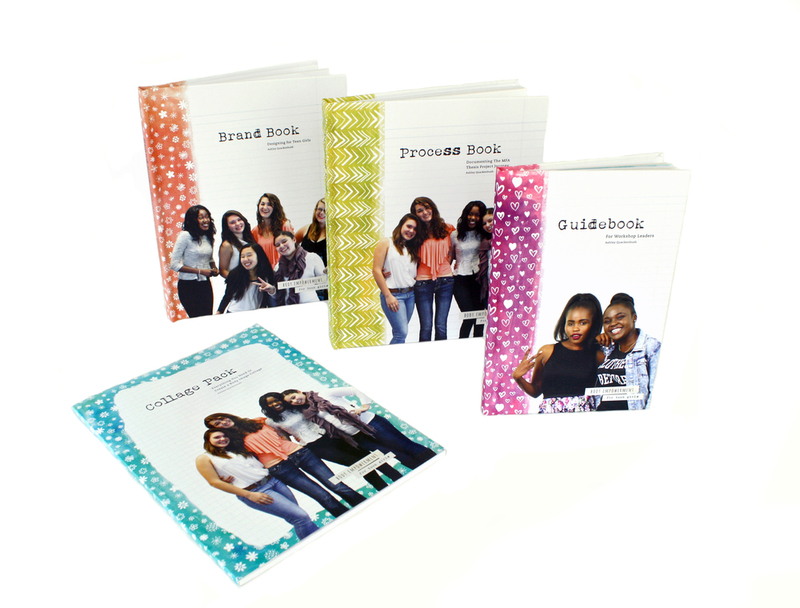 I created an organization, Body Empowerment for Teen Girls, which included identity/branding, website design, a Workshop Kit, and designs for social media. ders. Also, many teen girls fall in the moderate area of body image concern, their thinking and behaviors may be unhealthy, but not visible enough to get parents or professionals involved. TACTICS: I conducted original research through two surveys with teen girls at two local high schools and eight in-depth interviews for a total of 92 participants. The result was a focus on helping girls express their body image experiences and feelings through visual exercises developed for a small group workshop. The two project goals were accomplished by gathering personal body image experiences from teen girls and developing visual activities for workshop participants and online resources available through the Body Empowerment for Teen Girls website. Teen girls are able go through the interactive workshop exercises, and engage further through the online community by leaving comments, and posts through social media, get in touch with specialists, and gain access to tips and tools all through the website.